Third Voice asserts lyric beyond personal expression and drama beyond the stage, using the spectacle of minstrelsy as a deformation of mastery in an audaciously conceptual yet visceral performance. Praising the power of lyric drama, T. S. Eliot described the use of third voice as a means for characters to address and interrogate one another, and second voice as a way for characters to talk to the audience. In this daring new book, the principal narrator presents as a caricature reflecting the tangible experiences of a disembodied “I” posed against absurd selfhood—a voice imbued by sublime otherness. Within a dismantled minstrel show, Ruth Ellen Kocher frames a female voice splintered and re-figured as “self” and “character.” The incomprehensible nature of the sublime emerges through a cast of other personages including Eartha Kitt, Geordi LaForge, Immanuel Kant, W. E. B. Du Bois, and Malcolm X. Third Voice asserts lyric beyond personal expression and drama beyond the stage, using the spectacle of minstrelsy as a deformation of mastery in an audaciously conceptual yet visceral performance. whores. We have more light than we know what to do with. Live with it. Ruth Ellen Kocher is the author of six previous books, including domina Un/blued (Tupelo Press, 2013), co-winner of the 2014 PEN Open Book Award. 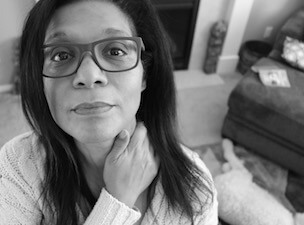 Her poems have appeared in various anthologies and journals and she has been awarded fellowships from the Cave Canem Foundation, the Bucknell Seminar for Younger Poets, and Yaddo. She is Associate Chair and Director of the Creative Writing Program at the University of Colorado where she teaches Poetry, Poetics, and Literature, and is a Contributing Editor at Poets & Writers Magazine.